JAAN working together with BAWA Bali to try and save these Dolphins back in 2014. “When I was there they were doing their shows, they were jumping, they were active, but seeing them between shows is even worse, it’s a horrible thing to see,” Mr Brokensha told Newscorp. I felt quite sad, quite disgusted. It looked like they weren’t happy at all. They just looked kind of lifeless and disinterested.” – Quote by Craig Brokenshaw, An Australian surfer also dedicated to getting these Dolphins released. In July 2014, 4 wild caught Dolphins dolphins were relocated by Wersut Seguni Indonesia (WSI) by truck from Central Java to the Restaurant ‘Wake’ in Keramas, Bali. Just a couple metres down from the famous surfer hangout ‘Komune Bali’. These Dolphins are now abused with the typical, commercial ‘Swim with Dolphins’ Program. Charging $75.00 for 20 minutes is pure business disguised under the name of conservation. These 4 dolphins travelled by truck for more then 30 hours from Semarang. International regulations don’t allow transports by land to happen for more then 6 hours and under very special conditions only. Most captive dolphins are confined in minuscule tanks containing chemically treated artificial seawater. Dolphins in a tanks/pools are severely restricted in using their highly developed sonar, which is one of the most damaging aspects of captivity. It is much like forcing a person to live in a hall of mirrors for the rest of their life – their image always bouncing back with no clear direction in sight. Laboratory research in 2012 (in other places that have Dolphins) proved that the water contains eight times as much chlorine levels as officially tolerated by mammals. Over chlorination causes blindness, skin disorders and general decline in health. Conditions in dirty water (usually full of faeces) cause infection and slow death in the dolphins. To know more about why Dolphins shouldn’t be kept in captivity, Our collaboration with Ric O’Barry’s Dolphin Project and our Dolphin Readaptation Centre please click here. 3 out of 4 of the Dolphins, photographed in their small pool. Almost 70 dolphins remain captive, die and are being replaced with wild caught dolphins continuously in Indonesia, under the authorization of the forestry department especially the central Java Forestry Department (BKSDA Jateng) and the Bali Forestry Department (BKSDA Bali) offices. The dolphins at the Wake Restaurant in Keramas, Bali are just another sad example of this. They are in a clear 10 meter x 20 meter swimming pool. What is even more heart breaking is that they are just 30 meters away from the actual ocean. When they are forced to jump they can see their actual home .. All of this for again, our ‘entertainment’. JAAN has been proactive regarding these Dolphins yet unfortunately still haven’t come to our goal as the Government keep turning a blind eye. If you don’t support this horrendous ‘Tourist Attraction’ as want to set these poor dolphins free then help us out. Join us, Many other Animal Lovers and Celebrities. Sign the petition now and show your support! Together and with numbers along with world wide fury and humiliation should be enough to grab the Governments attention, Once we do we are able to act. 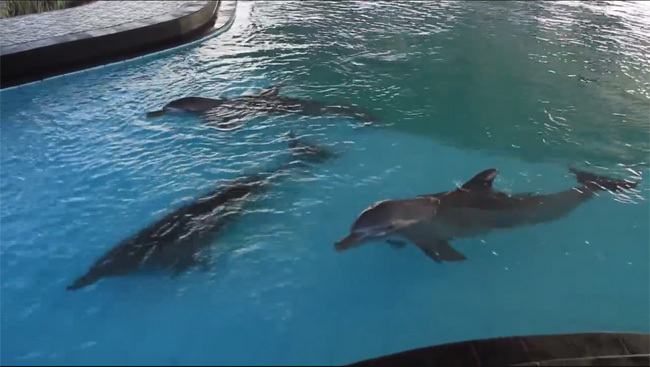 A recently released video showing further more that these Dolphins are showing signs of severe depression by the lack of movement. Another view of the pool .. You are able to see how close they are to the ocean and how small their pool is. The appalling condition of the Dolphin whist being transported. Stuck on the back of a trust with towels. INDONESIAN GOVERNMENT CONDEMNED FOR FAILING TO PROTECT DOLPHINS IN WAKE BALI RESORT. At first, after thousands of complaints from around the world. The current Minister of Environment and Forestry, Siti Nurbaya Bakar, finally took a visit and came back stating that the Dolphins were ‘healthy’ and did not see an issue. Recently, Approximatley around the 10/09/2015. The President of Indonesia, Joko Widodo, visited Wake Resort in bali and has since reported apparent plans to build ‘bigger’ pools for the Dolphins, on the land behind the resort with the Government taking 40% stake. We do not not need to go into how WRONG this is .. By increasing the pool space does nothing but ENCOURAGE the captivity of Dolphins. They still remain in horrible water conditions with skin irritations and cloudy eyes just to name a few. The urgent need for an independent veterinarian assestment by marine EXPERTS has been completely ignored. We now have confirmation that a blind dolphin has been removed by Wersut Seguni Indonesia (WSI) to their Central Java facility and replaced by ANOTHER Dolphin. This has created international uproar. The blind dolphin was placed in side the pool at Wake precisely 1 year ago. The high amount of chlorine in the pool to keep the water clean and attractive for tourists, has damaged the eyes of the highly intelligent mammal. The Dolphin replaced has been caught from the Java Sea, where the companies obtain the dolphins from, by using ‘loopholes’ in the existing and outdated Indonesian Biodiversity law 5, 1990. JAAN staff, supported by Australians from Animals International representing hundreds of international organisations, have received confirmation that one of the captured dolphins held in a tiny pool in the Wake Bali Resort had gone blind. The organisations have been advised that WSI provided a ‘replacement’ dolphin. As a result of this revelation, conservation organisations are demanding to know how many blind dolphins are being held at the WSI facility. What are the conditions they are kept in? Who is caring for them? What is their fate? Do they remain in highly chlorinated pools which clearly caused the blindness? Who is treating their blindness? Environment organisations have also been informed that “blind dolphins will not be used in shows”. The organizations call on the Minister for Marine matters and the Minister for Environment and Forestry to allow Animals Asia to bring in an independent veterinarian to assess the health of Wake Bali dolphins and dolphins held in the WSI facility. CEO of Animals International, Sue Arnold, has made contact with the Indonesian Embassy in Canberra requesting an urgent investigation into the Wake Bali resort water quality; an independent veterinary assessment of the Dolphins at Wake Bali and the WSI facility as well as an international expert review of these reports. “No country with Prevention of Cruelty legislation would allow this callous and brutal treatment of a defenceless animal. 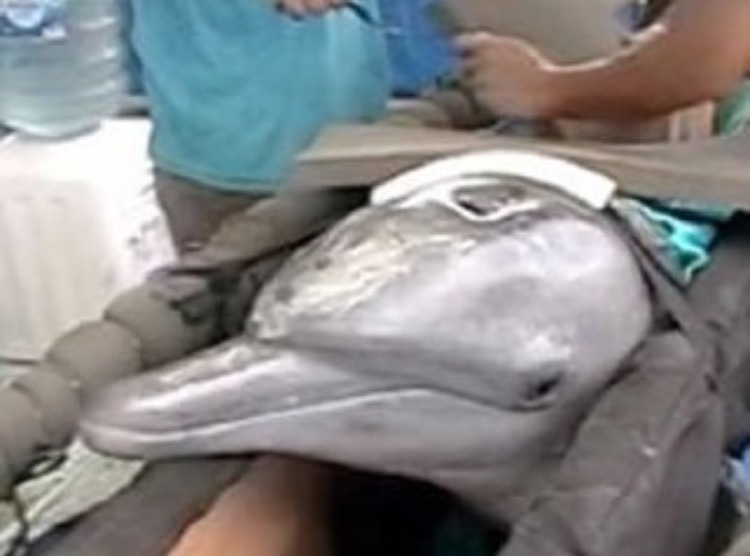 The conditions which create blindness in captive dolphins cause immense pain and suffering. To use these animals to make money as ‘entertainment’ for tourists is obscene. Unless the Indonesian Government acts to close down these facilities, Indonesian tourism and Indonesia’s international reputation will suffer. JAAN representatives have lobbied for a number of years now to have ALL captive dolphins tagged and registered. As stated earlier, an MOU between JAAN and the Forestry Department, undersigned by Pramudya Harzani (JAAN Director), Harry Santoso (National Director of the Forestry Department) and KKH Director General Darori was formalized on October 7, 2010 , to protect dolphins on a national level. 1. Indonesia is in need of a Rehabilitation Centre for Dolphins since many dolphins in captivity are kept illegally. 2. JAAN is the official partner of the Forestry Department for the protection, rehabilitation and release of Dolphins. The MOU, clearly stated ”There are still many dolphins held captive illegally which should be rehabilitated and released and ‘JAAN’ will be the formal partner of the Indonesian Government to protect, rescue, rehabilitate dolphins valid for 5years”. Following the signing of the agreement, JAAN with the support of Ric O’Barry from The Dolphin Project , built a sea pen in Barakuda Bay, Kemujan (Java). The pen is ready and remains un-used. The Indonesian Government risks international tourism sanctions and global condemnation over its failure to protect wild dolphins. There is no excuse for the cruelty which is being inflicted on these sea-creatures who are separated from their families, forced to live in a totally un-natural environment and to suffer the appalling problems that are inherited with fresh water that is chlorinated. Horrified? So How Can You Help!? We know that everyone concerned has been trying. We know you have probably already signed the petitions etc. But don’t give up! Please, if you care, re – sign the petiton here. Spread the word, tell everyone you know that may have not already signed it. AND write a letter to the Department of Environment and Forestry, Write to Siti directly and show your disgust. You can contact Wake Resort directly demanding these Dolphins be freed. All contacts will be stated below. Let them know that you will not be supporting this place until proper measures are taken place for the freedom of these poor Dolhpins. We have already put enough pressure to make the Indonesian Government squirm. We must continue to push to put an end to this and save the lives of these beautiful creatures. Don’t feel helpless! Where ever you are in the world you can help and make a difference, Even if it is just a small act. This man is in New York City and has decided to give a protest letter to the Indonesian Consulante regarding the Dolphin Traveling Show in Indonesia. Bless him!